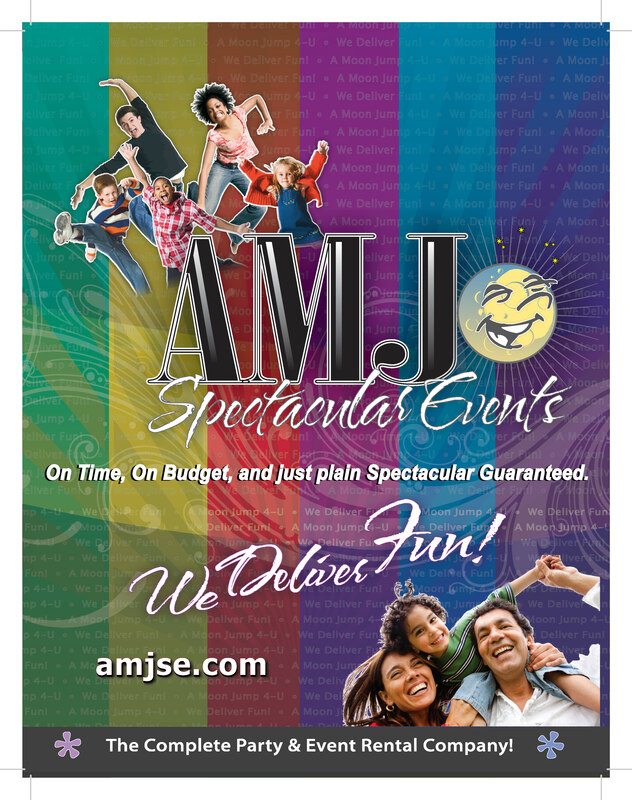 AMJ Spectacular Events 708-450-4386 is your complete party rental company, designed to fit any sized party at any budget. We take great pride in being family owned and operated while being supported by our dependable staff. Our Event Specialists have years of experience planning events for backyard parties, corporate events, picnics, country clubs, tradeshows, churches, colleges, and holiday parties. Also known as A Moon Jump 4U, AMJ Spectacular Events offers one of the largest inventory of party rental equipment in the Chicagoland Area. We’ve designed our inventory to fit the needs of children as well as “kids at heart” who want to add a fun interactive element to their party. Our products are fun and add excitement to events, which in turn creates memories that last a lifetime for everyone in attendance! Some of our most popular items includes our Dizzy X,Mobile Zipline, Rockwall, Toxic Meltdown, and our Trackless Trains, Party the night away in our Disco Dome or keep your guests entertained with one of our entertainers! Our selection of inflatables ranges from pieces suitable from 1 year old up to adults, which include obstacle courses, slides, moon jumps, and interactive rides. We know that the chilly weather lasts for months in the Midwest, but that’s not a reason to not bring some fun indoors! Guests will love posing for a picture in our Photo Studio, Photo Booths, Air Graffiti Wall and Green Screen. You’re going to love our Giant Classic games such as Giant Jenga and our Giant Billiard we even have childhood classics like Connect Four, Battleship, Hungy Hippos andTwister all in a larger than life size! Our concessions are a must have for Chicagoland event rentals try out our Hot Chocolate/Apple Cider Bar, fresh Chicago Mix Popcorn Cart, Mini Donut Cart, Cotton Candy & Sno Cone Machine and our Churro Stand. We also offer smaller inflatable games such asBulls Eye, Axe Throwing Contest, Bobbing for Apples, Football Toss, & Intractive Play Table perfect to liven up indoor events. But we could never skip on the basic essentials for most outdoor parties by offering both canopy &frame tents, tables, chairs, stages, dance floors, generators, and portable bars. Safety is a key factor to the success of an event. We take safety so seriously that in addition to licensing, registrations and being fully insured, we are also one of the only SIOTO (Safe Inflatable Operators Training Organization) Basic & Advanced certified companies in the Chicagoland area. Our pieces are routinely cleaned & maintained, however if there is an issue our on site design and repair center Amerizyn is there to fix it. As the sole company that repairs inflatables for products from all over the Midwest, you can feel confident in your choice of inflatable company. Additionally our staff is ServSafe certified & ready to safely serve your guests fun treats at your events. Our relationships with dependable and reliable vendors allow us to provide additional services to make your event truly spectacular. We want to be your “one stop shop” to ease some of the stress of event planning. Give us a call or email today to begin your planning!